It will come as no surprise to many of you when I say that I am a great fan of the brave new world of modelled, or virtual microphone technology. I have tried both Slate Digital ML-1 and ML-2 with the Slate Virtual Mic Rack (VMR), the Townsend Labs Sphere L22 and the newest player on the court the Antelope Audio Edge and Verge Mics. I think this technology only gives us, the recording professional, more power to shape the sound of our productions so the finished product can be exactly how we imagined it. There is however another very useful side to using this new technology. A use that I have been putting the Slate Digital ML-2 mics to in this last week while recording multiple groups of young performers. The last couple of weeks has seen me wearing yet another of the audio hats that makes up my rich and diverse career. I’ve never been one for the 9-5 or being stuck at a desk doing the same old same old and recently I have been working with an old friend and his company MyBand who provide “Rock School” type courses for young people aged 11-18. It’s great fun and very rewarding to see young performers grow musically in a very short space of time. One of the activities we get the students to partake in is writing an original song. They then rehearse this and we video and audio record the songs on the final day of the course. You might be able to see where my skill-set fits in here! This past week we have been working at a high school in the Essex area of the UK, about 40 minutes drive outside London. We had 21 students for 2 days and put them into 4 bands. They, and we had to work fast as the second day of the course was also a performance to their parents and family at a venue local to the school. This left me just a morning (9:30am till 1pm) to record the 4 bands original material. Four songs in a morning is no mean feet with a professional well rehearsed band let alone 4 different bands of performers, some of who had not been playing their instrument all that long. In situations like this “Keep It Simple” is the way to go. I use my trusty Mackie DL32R digital rack mounted mixer which has a useful multi-track recorder built in as the main recording platform. All the bands had a drummer and I set up my Yamaha kit with a Shure SM91A kick mic. The two Toms and Snare were recorded with Sontronics DM-1 S and T respectively. Leaving me the HiHat and Overheads to deal with. None of the drummers on the course were what you might call “experienced” so it felt like overkill to go for stereo overheads. I opted for a mono overhead and hat mic and chose the Slate Digital ML-2 small diaphragm condenser mic as I could make these mics sound as I wanted them to in the mix. 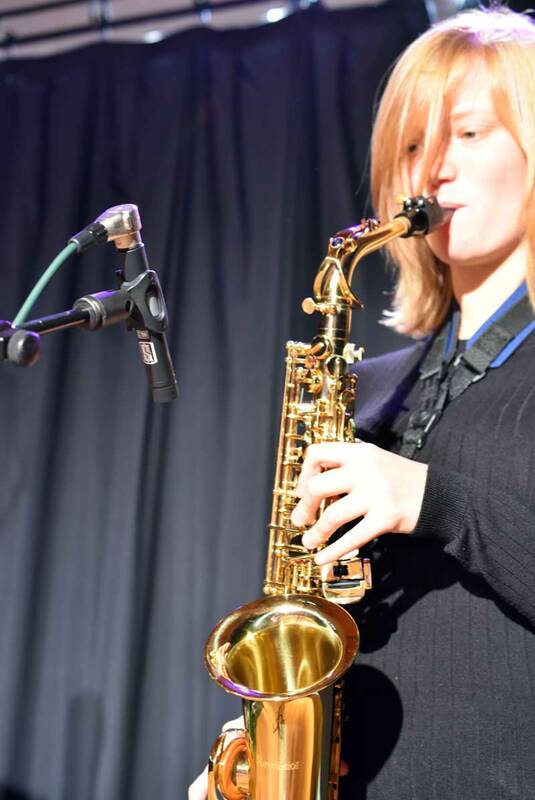 I learned a long time ago that in teaching you never know quite is around the corner and on this course along with the normal guitar, bass drums and keyboard players and vocalists, we also had a Cello and Alto Sax player. Now this got me to thinking. 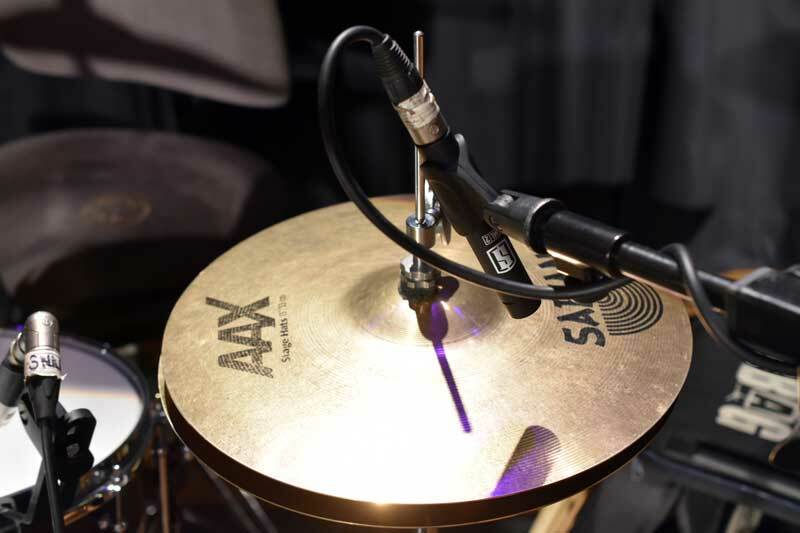 In the recording stage, I’ll just use my other Slate ML-2 microphones for the other instruments. Normally I would put something like a Shure SM57 on an electric guitar speaker cab. I might choose a nice dark sounding ribbon mic on sax and a nice smooth sounding condenser mic on Cello. Using the ML-2 this can all be done with one mic. No messing with swapping mics and clips and cables. You can see below the final Virtual Mix Rack set-up I used for mixing the Alto Sax featuring a Slate S-121 model ribbon mic emulation. The Cello was also an interesting instrument to record. Normally I would come back quite a lot more from the instrument to get the tone and body of the instrument but when the Cello is surrounded by guitar amps and drums I went with “the closer the better” to try as best as I to could keep the unwanted bleed out of the cello mic. In the end I used the S-67 emulation on the cello and even though the ML-2 is small diaphragm rather than large we got a nice big round Cello sound in the final mix. 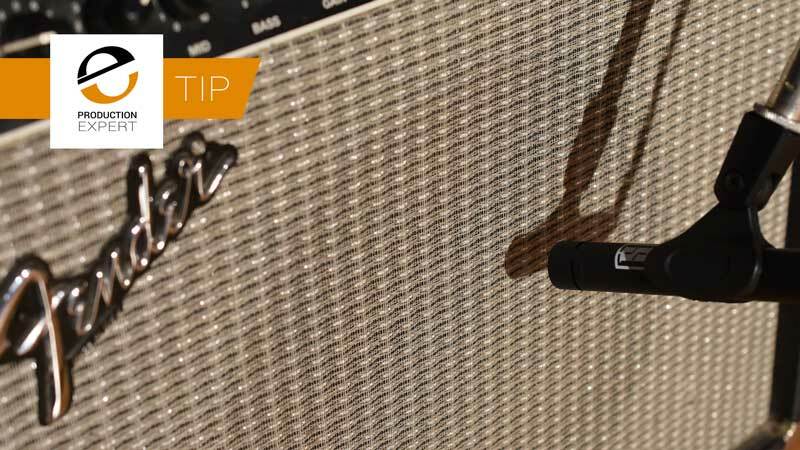 Normally I would reach for an SM57, put it nice and close to the speaker grill clothe and go with it, but having the flexibility to change the mic means I could play around to get the right tone. One of the new songs had more of a jazz feel to it and the guitar part sounded to harsh with a dynamic 57. I chose instead to use the S-414 Normal model with the FG-76 pre and come classic British EQ. This strip worked really well to give a nice rich sound to the rhythm guitar parts. In this project the hardware was king. Using one type of mic for all changing instruments in the session meant that the sessions could move fast and not get bogged down in “Oh let’s change this” and “Let’s just try that”. We didn’t have time for that. Truth be told the hardware sounded great on it’s own and then when I added the VMR models in the mixing process the parts just came to life. To sum up, you might not approve of, or even like what you think modelled microphone technology has brought us by way of infinite options and “stuff” to tweak, but sometime when you just have to get the work done, it can be very useful to look and work a little outside the box. Do You Know How To Set Up Your NAS So It Mounts Every Time You Boot Your Mac? Shut Down Or Just Let It Sleep - Which Is Best For Your Mac?